How To Change The Children’s Attitude? 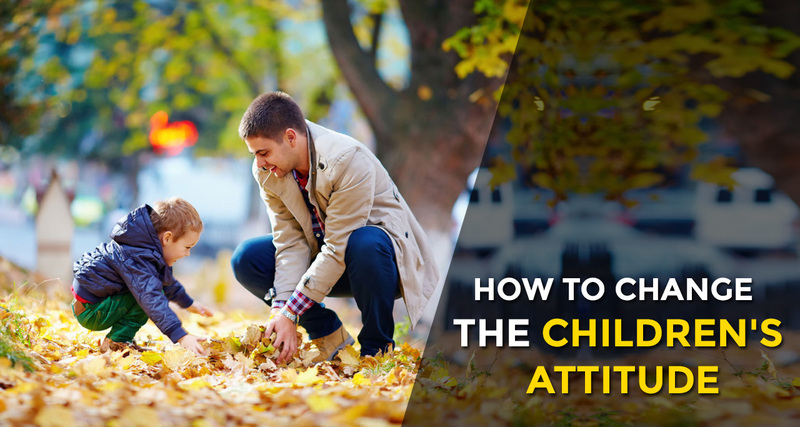 Do your children have a positive or negative attitude? You know what I mean by the negative attitude – Rude, Selfish, Insensitive, Jealous, lacking confidence, Laziness, Nervous, Scary or Irresponsible or any other degrading attitude? How to prevent or destroy these attitudes? The first step is to figure out which attitude you want to change and what are the methods to change those attitudes? First of all, everyone has a common mistake of saying in a generic form, “He is got such attitude”. If it is a good attitude, then that will make a child grow if not it will detain. This attitude is specifically brought out when something is tuned up, then you suggest a name for it and that is the attitude you might want to stop. In order to prevent this attitude first pretend not to showcase this attitude that bothers you. The more you showcase on this attitude, the more the children will stick on to it. So it is in the hands of parenting to ignore this. The Second step is you need to plan accordingly. If your current plan is not working then you need some good plan to turn it around. So that you will get a new response. The third step is that you need to commit to that plan. Initially, to execute a new plan and to stick to it takes three weeks. According to the doctor’s perception, a new attitude to inherit in your child will take around three weeks. This is because an attitude is a habit; it’s not like a behavior that’s a quick time-out. These attitudes are your children’s premises that move on with your child through their entire life. And the reason why our children’s bad attitude doesn’t go away is that we don’t use and commit to the plan long enough. For instance; go back to your New Year resolution, the average resolution just lasts for two to three days and then we quit. The parenting goal should first stick to the longtime goal and prevent from the one-stop lecture. What are the methods to change these attitudes? Most of the parents believe that these attitudes come from the toxic world like copying from their friends, relatives, neighborhoods, media, etc. Of course this is fact and the bottom line behind this fact is they try to avoid these negative scenarios rather than turning those bad attitudes around. To avoid or change or destroy these attitudes there is a single and powerful solution to this problem is none other than the “Chores”. The chore is the only one best way that can show the path to the positive way from any kind of negative attitudes. Being a parent, you would start believing the importance of chores at the end of this blog post through a short real-time story. Once upon a time, there lived a young man who went for an interview. The HR interviewed him looking at his profile. The young man was talented to answer any kind of queries. But the interviewer was surprised looking at his profile the young man was from poverty family but completed all his graduates. So the interviewer questioned him about his family. The young man replied with the pride that he belongs to the community of laundry workers, where his parents step door-by-door collecting people’s dirty clothes, wash it, dry and iron those clothes with no helping hands and return them by end of the day. The recruiter asked to show the young man’s pair of hands, it was clean, smooth and well-manicured and found that he has not experienced in the laundry works. He said to the young man to clean his parenting hands and return to him the next day. The man left the place thinking that he failed in an interview. But he followed the advice of his recruiter and slowly began to clean his parent’s hands. Only then he noticed how their hands were wrinkled, calloused, bruises and realized about their parent’s sufferings due to years of washing clothes. The young man was wakeful that night listening to their parent’s stories and decided to help them onwards.The next morning he returned to the office, the recruiter noticed his eyes with shedding tears and lack of sleep, received a pleasant reply from the young man. The young man was then hired. So better stop becoming over-protective parents, and make your children independent by allocating the chores and make them experience with those. Make it a regular practice, so that they will learn from the chores, how to cope up with the difficulties. This will definitely lead to a good attitude. So the chore is the best way to learn the good attitudes. Now I guess you would have understood the importance of the chores that can change one’s attitude? Feel free to share your valuable thoughts on this blog post.